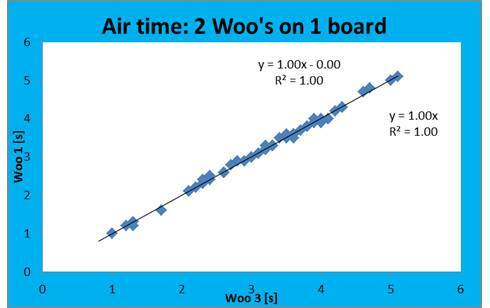 After our first test of the Woo we were left with some questions; we found a good relation between 2 Woo’s on one board, but it wasn’t perfect. After a interview by Skype with the people behind Woo Sports in the States, it became clear we had a possible firmware difference between the two Woo’s we used in the first test, which could be the reason of the 15% differences. Apparently a few devices of early 2015 have a firmware that is different from the others. We did a second test and used 2 devices which had the same firmware and put them close to each other and made sure both batteries were fully loaded. 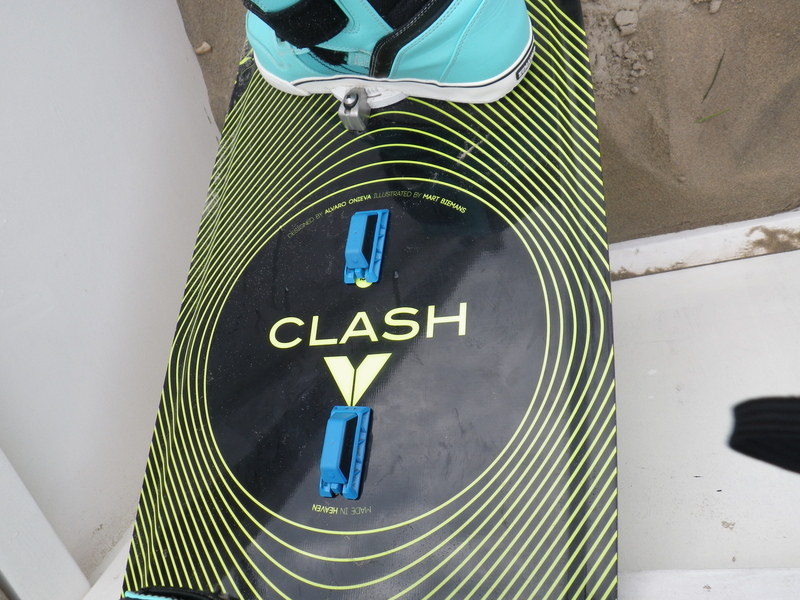 We tested them with 9m (2015 North Dice on a Ride Clash 1.38 with boots) kite in a steady 24 knots of wind with waves up to 2,5 meters. As described before in part one of the test, the device has a difficult task. The Woo uses “just” a motion sensor. Any idea what that is? Think of it as being in the back of a car blind folded while you need to guess the speed of the car by feeling the force of somebody using the breaks. Okay, let’s get straight to it; The test results were astonishingly good. Looking at the graphs on both the height and air time, we have to admit these data is near perfect. 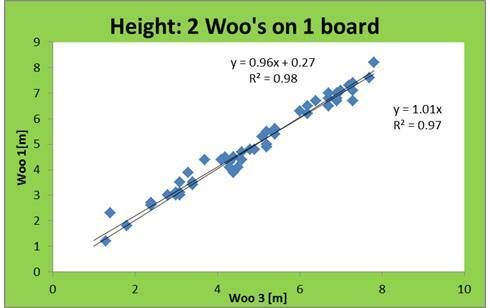 Both for height and Airtime measurements no biases and no corrections needed. Two perfect identical devices with an average deviation of 1 %. Compared to our first test there is even more good news; the 4 meter minimum height as lower detection limit was not found again. Which means pretty much all the jumps (in this case from one till 8m’s) where comparable. 1: The firmware update is at this moment (12th April 2015) not available, although it should be a matter of weeks before this will be solved. So devices received in and around January 2015 still do deviate at a fixed rate of -15% or so from later ones. 2: Some jumps where missing. i.e. One Woo had a jump registered, while the other didn’t. In most cases these were typical close to one meter jumps but we had one jump above 3 meter missing. 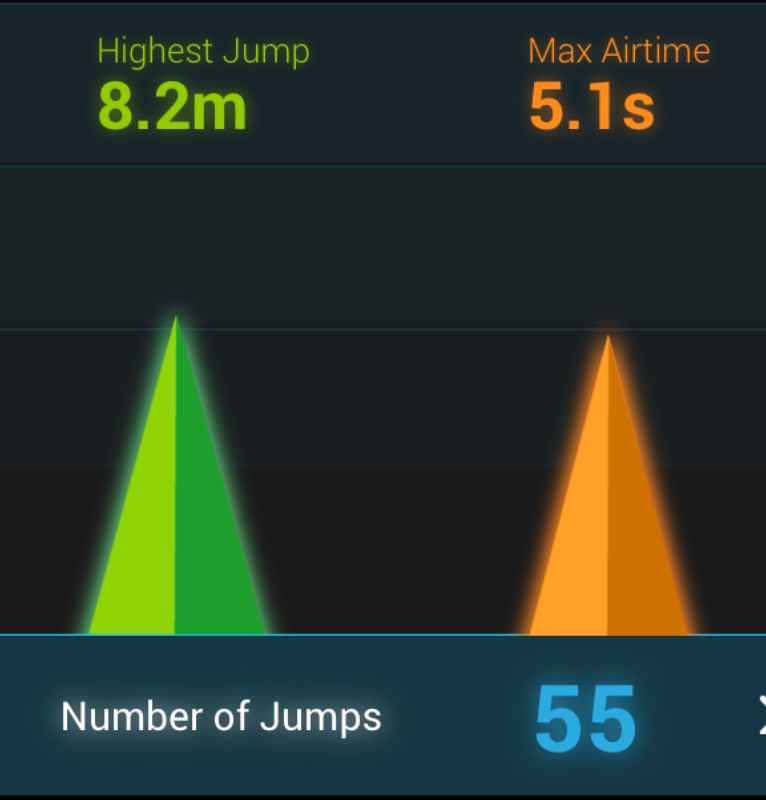 There was a total of 44 jumps greater than 3m. On WOO1 we found all 44 were detected. While on WOO3 we found 43 jumps were detected, 1 was missing. If we take the total jumps >3m detected/total number of jumps, we see an average of 98.9% of jumps were detected. The WOO’s are so well correlated that it is all most impossible to get them any more consistence. Apart from the two mentioned minorities, there is one more thing to explain. As you may have noticed did we have a difference in maximum heights measured in our test of 0,4m; 8.2 to 7.8 meters. This difference is completely within the statistical measurements consistency and just is part of everyday life accuracy. Something which is in inevitable. 1: The firmware update: If you are worried your device is not up to date, you can check your device’s firmware version in the WOO Kite App. Go to “Settings” and select “Devices”. You will see a list of WOOs registered to your account with the firmware version below the ID. Version 3.16.70 is the latest. If you see an earlier one (like 3.16.44), keep boosting with your WOO, you can expect an email with instructions for how to update it very soon. 2: One jump >3m missed: While we always aim to have the highest quality results with our algorithm so it detects every single jump consistently, this one jump may be an edge case where there is room for improvement. Although these results are good, we are working tirelessly to make the algorithm better, especially the edge cases. Please add a ring to the device so you can add a safety line to the main body of the Woo,,,,a few people have lost them. – Mounting WOO (personal advice) preferably by the provided sticker. High screws might damage the Woo.